Irish satirist and essayist who is best known for his Gulliver satires. 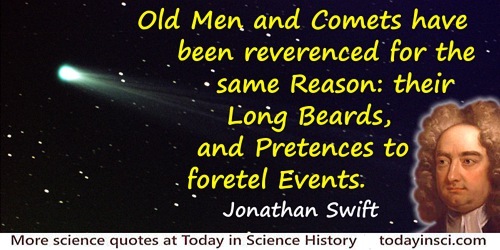 Old Men and Comets have been reverenced for the same Reason: their Long Beards, and Pretences to foretel Events. 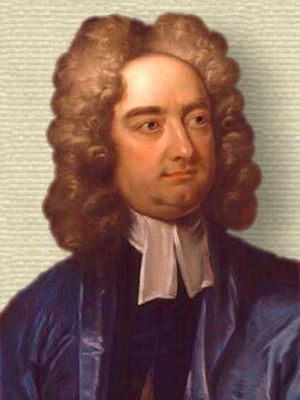 Thoughts on Various Subjects (1727), collected in The Works of Jonathan Swift (1746), Vol. 1, 317. The Mind of Man is, at first, … like a Tabula rasa; or like Wax, which while it is soft, is capable of any Impression, until Time hath hardened it. 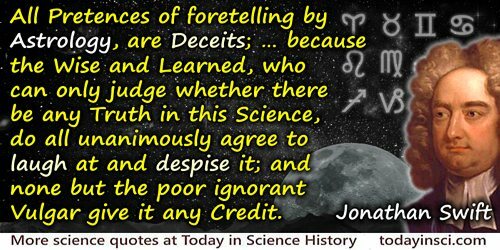 In 'A Tritical Essay Upon the Faculties of the Mind' (6 Aug 1707). A tabula rasa means a “scraped tablet” or “blank slate” and refers to a kind of wax-surfaced tablet used to inscribe notes, that can be erased by heating the wax.